Trained as a domestic science teacher and taught at local schools - later became an examiner. Her husband, Richard Hurst OBE was head of the Richard Threlfall engineering firm and President of Bolton and Bury Chamber of Commerce. Represented Bromley Cross Ward on Turton UDC 1968-74 and on Bolton Council 1974-94. Honorary Alderman of Bolton Metropolitan Borough, admitted 1994. She was awarded an MBE in 1993 for services to the public and the community in Bolton. 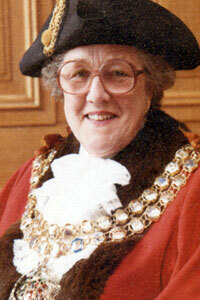 Member of the governing body of Bolton Institute which awarded her an honorary degree for her work in 2000. Chair of Governors at her old school, Mount St Joseph and also of Bolton Sixth Form College, Sharples School and Birtenshaw School. Opened the new Festival Hall and the rebuilt Albert Hall in Bolton Town Hall on 12 April 1985. The original Albert Hall was destroyed by fire on 14 November 1931. She was a dedicated campaigner for local charities and was Chairman of the local branch of the Arthritis Research Council, of Newstalk (the talking newspaper for the blind) and the Bolton Catholic Handicapped Fellowship. She was also an active supporter of Fortalice - Bolton's hostel for battered women and their children - from its inception. Her two daughters, Ruth and Jane, shared the role of Mayoress for six months each. 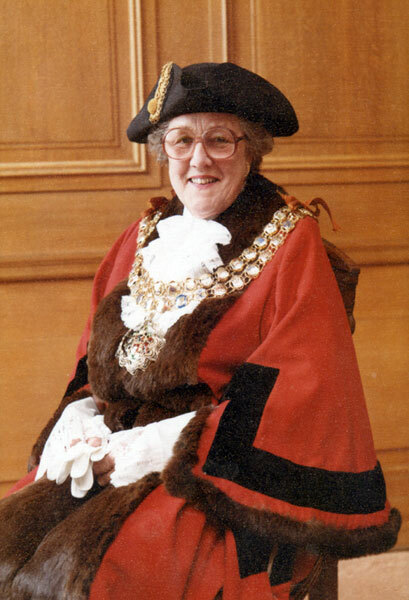 Formal portrait of Barbara Annette Hurst as Mayor of Bolton.